Called “Florida’s Forgotten Coast,” Apalachicola offers a wealth of activities without compromising the relaxed feeling both our residents and visitors know and love. Stroll by antique shops, visit art galleries, watch from the shore as fisherman bring in the daily haul of fresh catches. Take in the fresh air and relax as your troubles and hectic pace back at home drift away on a Gulf breeze. There’s something charming about this area that draws visitors back time and time again. 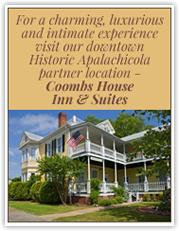 We can’t wait to meet you and make a new friend here at Water Street Hotel in Apalachicola.